Avocados are a crime against humanity. So are HOAs and their CCAs. We have one, explicitly set up to maintain common ground (wetlands), retention basins and storm drainage. Couple years ago, they tried to regulate trash collectors, and restrict residents choice of trash collection contractors. I put the kibosh to that, and was public enemy #1. Much to their dismay, I read the CCAs and knew the HOA's limitations. Someone didn't get their commission from the favored contractor. 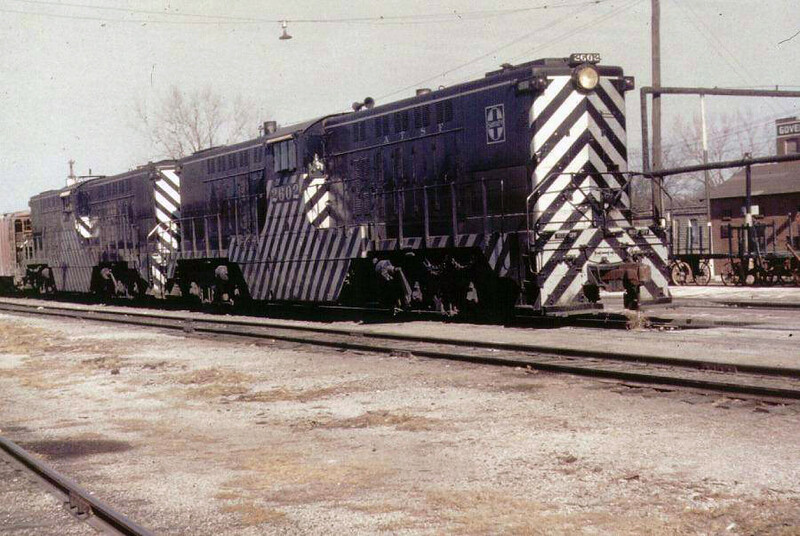 The F7s were damaged in a wreck, and EMD rebuilt them in F9 bodies. Even if it didn't happen with those exact units, the practice was common enough to make it plausible. I think the biggest spotting feature for an F9 is the very rear of the engine, whether it is straight or tapered. I like it. We'll go with that. One of them is wearing Chessie colors, but by the time of the CSX merger and acquisition of C&O, I'm sure there weren't many F series engines still in active service. I also do not like avacados. Haven't accomplished much today other than rescheduling my annual VA appointment until November based on expected travel plans. Brother called yesterday and projected discharge is somewhere between 20-27 August. If we can get a firm date I will probably leave early and go to OH first. Chet- I agree they seemed to be the go to company for non-standard track needs. Toot- Thanks for the video. Louis- Good to see you checking in. Are you getting any train time in? Willie- I totally understand you about being inconvenienced. Sherrel- I can take or leave avocados. Repairs work is the same with me. Garry- If Sherrel painted a confederate flag on his RV the HOA would probably call SWAT and he would be on the national news especially in CA. Back from the landfill. I mentioned to the Mrs. about since some Chinese factories are closing, getting track for my new freight yard maybe difficult. The Mrs. said why not purchase your track now instead of waiting. Looks like a green light for the expansion of my layout into her domain. Good morning, and happy National Avocado Day. It's cloudy and 71, with 1-3" of rain, and flash floods expected over the next day or so. afternoon Fellows .... It's clear, 96 degrees (says feels like 100) with only 28% humidity. Sure feels like more hotter than that. Started breaking camp at 10 am ... just arrived back at the homestead where the postman just delivered a registered letter from the HOA with a picture of the RV sitting x-ways in the drive where we loaded it up for our trip last Thursday. Have to go before the Board on the next meeting on the 7th of August. Going to be an interesting meeting for sure. They are acting like I cannot even bring it into the subdivision at all! GOD! I Hate HOA'S! That's all for now - glad to see that everyone is still Choo- Chooing and Chugging along. SHERREL There is a gated community 5 miles from me whose HOA does NOT allow motorcycles beyond the guard shack. You must trailer it in or park it in a special lot by the gate! On the avacados? I like them but the seeds are difficult to swallow and even harder to pass...…………..
LOL, DAVE .... You are correct about the seeds! They are pretty tough to crack as well. That's pretty bad about the cycles as well even though seems most fellows who have them like to sit at a stoplight and "gun" the motor - making as much noise as they can... vroom, vroom, vroom! A guy down the street leaves for work pert ner 5AM every day. He makes sure that everyone hears him leave! A guy down the street leaves for work pert ner 5AM every day. He makes sure that everyone hears him leave! Sherrel: There is no point to owning a cycle unless you can rev the motor... There is no point in owning an RV unless you can flaunt it. When is National Egg Plant day? Ha! that's funny, I guess if you look hard enough there is a self proclaimed day for everything! Ran some trains this morning. My GP7 is officially on the active roster. However it is still a dummy unit as I will eventually get the parts to make it a powered unit. For now it'll stay lashed up to my GP35. Some riders are just plain rude. I try to be as quiet as possible as all the folks in the area are well armed!! I think it follows National Zucchini Day. Good Morning Folks. An incredibly nice 65° and clear. Barely hit 89° yesterday and today is forecast to be 93°, both considerably below average for this time of year. More normal upper 90's resumes tomorrow when the northerly wind shifts to southerly wind. With the cooler morning yesterday, I resumed my endless tree pruning of some trees around my currently dried up pond. I know that summer isn't the ideal time for major pruning and I am just removing low branch ends and dead stuff that are a hazard when mowing. Much more needs to be done after 15 years of neglect. Today I will fire up the tractor and mow around the septic tank/lateral lines. Out in the train shed, I once again spent the bulk of my time running various trains. Did an out and back local switching run that took over two hours switching 14 cars at six industries. I also ran three through freights from end to end to disrupt the switcher. Two were unit grain trains and the third was a priority container freight. I also put up a few more pieces of fascia, I am beginning with 8' pieces that don't require trimming before I set up the saw horses and Skilsaw for the rest. Looks like more progress in the beginning. In case anyone missed it, Ken in MD started a most excellent weathering thread yesterday. It's obviously the reason that we haven't seen much of him here. Check it out. Jesse - That update on your late friend seems to be a horrible example of employer negligence. As a former factory manager with years of safety training and certification, I am appalled if the information given to you is correct. Unfortunately OSHA exists only for employer harassment and they will hit them with a minuscule fine and a slap on the wrist. I had to take a thirty hour training course just to learn how to read their handbook; every five years! Restriction just says "No RV parking on the street or driveway"! Just tell them that the motor was running so it wasn't technically parked. Thank you for all the support regarding avocados! Today we celebrate National Girlfriends Day, and World Naked Sailing Day. I'll miss both. Don't have a girlfriend or a sailboat. Motorcycles revving up at 5:00 am don't bother me at all, it's too early for me to have my hearing aids in and I can't hear them. Good morning. It's cloudy and 71, with more flooding expected later. Today, we celebrate National Girlfriends Day, and World Naked Sailing Day. I'll miss both. Don't have a girlfriend or a sailboat..
That NGD is just as overrated as Valentine's & Sweetest Days. Just another holiday made up by the greeting card & floral industries. I don't need a calendar to tell me when to romance my wife. I prefer to do those things when she's not expecting it. That's more "romantic" IMO. Just following another life lesson my Dad taught me. Today we celebrate National Girlfriends Day, and World Naked Sailing Day. .
Hmmm, maybe I can combine the two?? Willie .... It is good to read your post about operating trains as well as the fascia project. .... It was good to hear Ken D&J is somewhere in the forum if not hear. I hope he returns to the Coffee Shop soon. ... On a branch line, I am operating one of my Genesis GP7's to serve small industries.... I'm enjoying the realistic sounds. ... 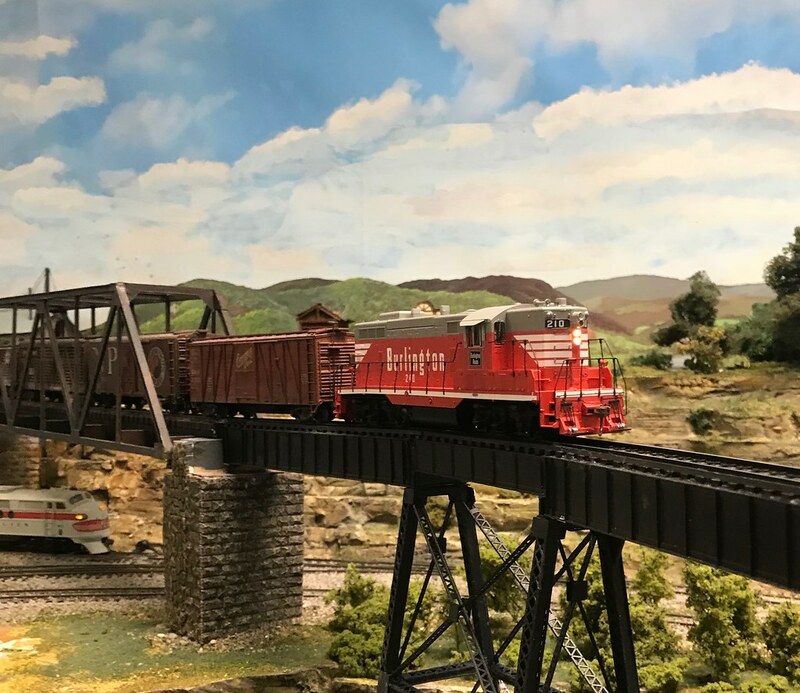 Here it is crossing over the main line on the bridges I installed in recent months. .
Below are some Santa Fe locomotives to start a conversation. Actually, I think we talked about double ended switchers several months ago. Interesting beasts. Good morning y'all. Currently 72, overcast, and 100% humidity. High of 82 with a 70% chance of storms. Although my weather app says that the closest lightning strike in the last 30 minutes was 379 miles away, I'm going to keep my eyes open anyway. Nothing new from the train shed (unlike Willie, I do not have a literal train shed, but I like the sound of it). Hoping to get some time soon to start inventorying all of the new rolling stock. I have started posting pics of the locomotives with description and plans on my model rr Facebook page. Probably kind of boring to the casual observer, but it's the easiest way for me to keep up with it since it's basically free storage and I can access it from anywhere, any time, on any device I may have handy. As my schedule allows, I can get into the maintenance and detailing process. I also need to work on a maintenance plan for my equipment roster. Willie - that unfortunately is the truth. Even if OSHA finds them at fault, they will get a slap on the wrist and a fine. My friend will still be gone and his wife still a widow. It's ok though, because I know he's picking his guitar with Jesus now. Since it seems every day there is a new made up national holiday, I'm going to start my own. I am proclaiming this Friday, August 3rd as National Send Jesse A Dollar Day. I will be asking that all people in the US send $1 to a special post office box that I will designate for the purpose. Good morning. 59 degrees to start off the day with an expected high in the 80's. The winds must have changed and the smoke from the California wild fires has rolled in. Joe - Must have felt nice to stick it to the HOA. Sweet. Justin - Like the C&O GP-7. You could probably find a powered unit for any railroad from the same manufacturer and just put the shell from the dummy onto the chassis after tuning it up. HOAs. Some of them are a real pain barring so many things for the home owners. Garry - Nice photo. Those switchers are sure different. Interesting. Not much yard work to do today. Move a few rain birds and water the new bushes we put in. Then I should have some time for the trains. I did run trains like Willie yesterday and got one ready to go to the club tomorrow with Milwaukee Road power. Still painting some figures. I do jst as many as I can until my left eye wants to look at the right eye.